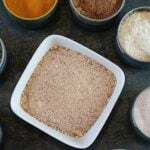 If you have read my post on the dangers lurking in your spice cupboard, you are probably ready to start mixing up your own spice blends. The primary use for this steak seasoning is, well, steak. However, it goes well on pork chops, chicken, ground beef, and even homemade french fires! It will take you less than 5 minutes. I promise. Directions for homemade steak seasoning: Mix all ingredients well. Store in an airtight container away from heat and light. An additive-free delicious steak seasoning blend that is quick and simple to prepare. 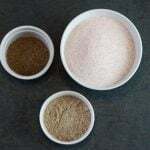 Mix equal parts organic celery seed with fine sea salt. Blend in a coffee or grain grinder. I have a dedicated spice grinder so that I don’t get a coffee taste from using the coffee grinder. Enjoy your additive-free celery salt! Use in the spice mix above, Old Bay copycat recipes, dips, egg and potato salad, and even a Bloody Mary. An additive-free homemade celery salt that is a cinch to prepare. Grind these together in your spice grinder. Store in a cool, dark place away from moisture. Do you have a favorite steak seasoning recipe? What is in it?